Over the past 20 years the Fishabout team has been put together with like minded individuals and businesses, choosing to remain a specialised, well managed operation ensuring ongoing personal and professional service. We are all dedicated to delivering the most magnificent locations and lasting memories to all our clients. We are a dedicated Fisherman's travel agent with a simple philosophy; "Best Guides, Best Locations, Best Seasons". This philosophy ensures our customers have the greatest chance of landing the fish of a life-time. On top of that we also package fishing trips to over 20 domestic and international locations. We target the planets top 20 Sports fish and select destinations based on these target species, guiding expertise, food, accommodation and the natural envrionment. Fishabout is an eco-fishing company, adhering to strict sustainable fishing practices, with "table" catch only. We also believe that fishing is one of the simple pleasures in life, where the reconnection with nature, family and friends is as important as hauling in the big one. Please enjoy our site and we look forward to sharing the world of fishing with you! 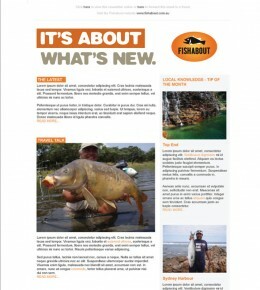 Fishabout has been promoting and supporting sustainable fishing practices throughout Australia for more than 20 years. This ethos has formed the cornerstone of our company as we strive to promote fishery management for the future enjoyment of generations to come. When it comes to fishing trips the guides are everything. That is why at Fishabout we only use the best guides to ensure that you get the best experience possible. The benefit of booking through us, opposed to direct with a lodge, is that we take all the hassle and headache out of organizing your dream fishing holiday and you pay no extra.